Right now the only bentos I’m doing are really for Emma, since she is the only one who HAS to bring lunch, but I was off of work last Thursday and Friday so I made a couple of wannabe bentos for the other kids. 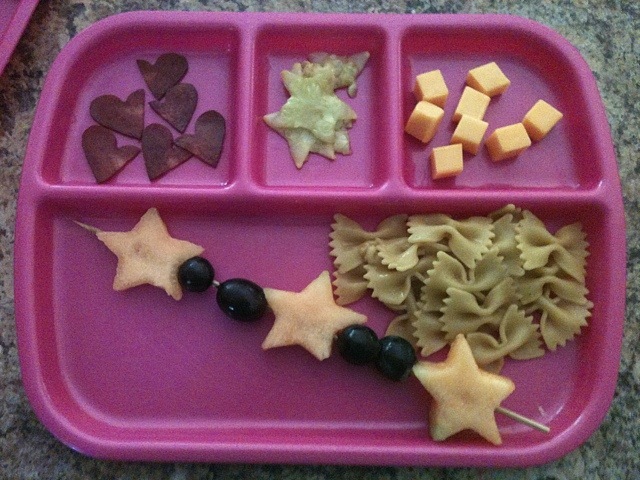 I’m going through a clean-the-pantry type of thing right now, so I just tossed a bunch of things together: fruit skewers with grapes and cantaloupe stars, bowtie pasta, turkey bacon hearts, sautéed squash stars and Colby cheese cubes. The turkey bacon hearts are probably my favorite because they were a happy accident; I cut the ends of a pound of bacon to oven fry and put in with the pasta, but they were cute enough to stand on their own, so they did! And the kids loved them. After an afternoon of swimming, Saturday night we came home and the kids were asking for Lunchables. I don’t buy those for a variety of reasons so I made my own. This is really a pretty straightforward bento: Ritz crackers, deli ham, cracker cuts, one Colby lamb, broccoli trees, quartered carrot stick logs, star-shaped pasta with melted mozzarella and vanilla wafers with Nutella between them. To add a little special touch, I wanted to put a Bible verse on a little paper and put it in the container, but the only Bible I could find was my huge family Bible at the time and I just wanted to get it over with so we could play Family Game Night on the Wii, so they just ended up with “Jaiden/Jaylen/Jenna had a little lamb …” on a sliver of paper taped to a paper straw (I cut one into thirds). My oldest, who is nine, said, “‘Jaiden had a little lamb?’ Really?” and laughed. But, you know, I thought it was adorable. They adore the paper straws, though, and went into the drawer to get one each to drink their milk. lol. 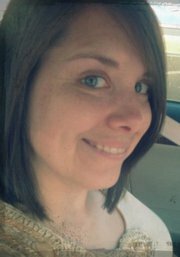 They were also a little bewildered at the lamb’s eye, which I poked out with a pen. He was precious, though. 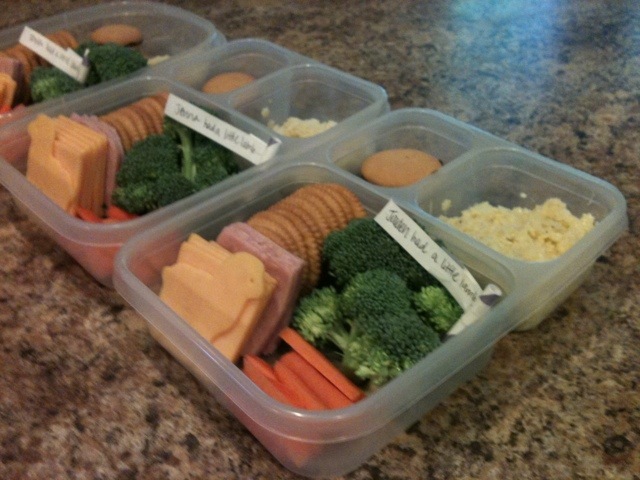 I will say this: making bento lunches is difficult, especially times three or four. I did see some bento boxes in the new Pottery Barn Kids catalog and want to order them at some point, perhaps, but at $14 a pop I’m not sure when that will be. We might stick with the divided plastic containers for a bit.